Adding your own portfolios helps you to efficiently track the performance of your investments. Create portfolios for all of your brokerage accounts or even create “virtual” portfolios to test different investing strategies. There is no limit on how many portfolios you can create, nor on how many stocks you can have in a portfolio. Type a name for your new portfolio in the field labeled Name. The name you use can be anything you want, but every portfolio must be named differently. You may also add a description of your portfolio in the Description field, but this is optional. In the “Live Quotes” tab, you can specify how often the quotes in this portfolio are updated. In the “Portfolio” and “Currency” tabs, you can specify other properties for this portfolio, including the base currency of this portfolio. Click “OK” to save your new portfolio. 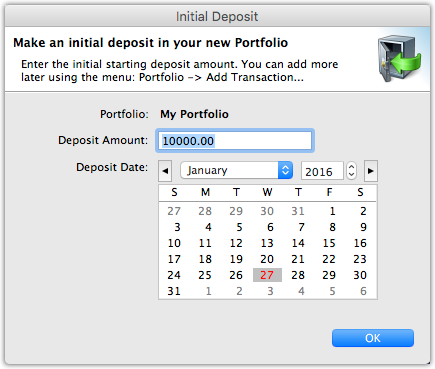 Before you can use the portfolio, however, you must enter an initial deposit. The default amount is $10,000, but you can change this to be any amount you want, including 0. It is also possible to add (or remove) cash later. See the section Managing your Cash Balance for more details. Be sure to change the “Deposit Date” to an appropriate date. The new portfolio will now be available in “Portfolios” section of StockMarketEye. You can modify the name of a portfolio by double-clicking on its name in the list on the left. 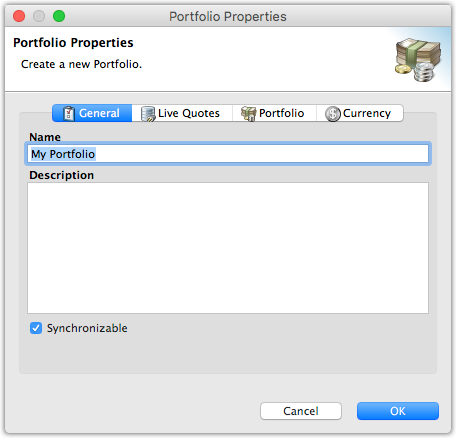 This will display the “Portfolio Properties” window where you can change the Name and Description of your portfolio. You can read about the other properties available for portfolios on the Portfolio Properties page. When a portfolio is deleted, all of the stocks in that portfolio as well as all of its transactions are deleted. 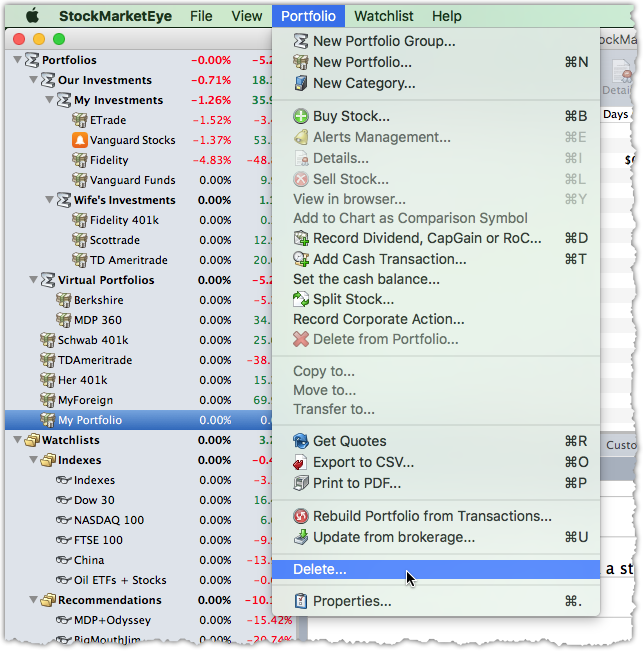 Deleting can not be un-done, so you need to confirm that you want to delete the portfolio before StockMarketEye will actually delete it.